1. Taking advantage of his extreme thinness, Mr. Vieux Bois gets in through the chimney, which rather alarms the object of his affection. 2. Escaping through a narrow opening. 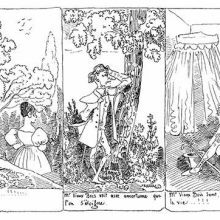 Strip of two drawings showing a man sneaking into his beloved’s bedroom through the chimney and then pulling her out of an opening in a wall. 1. Monsieur Vieux Bois, profitant de sa maigreur extrême, s’introduit par la cheminée, ce qui effraie fort l’objet aimé. 2. Évasion par un soupirail étroit. Rodolphe Töpffer’s graphic literature met with notable and lasting success, causing his books to be pirated, abundantly imitated, and sometimes translated into English. 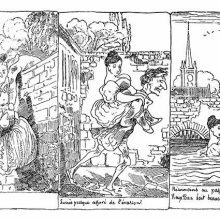 In 1860, the Paris publisher Garnier Frères set about to issue reprints of some of them and, to this purpose, had François Töpffer redraw the strips from early copies of his father’s work. Several reprints of these recreated plates followed, up to the 1920s/30s. The book presented here is a copy of one of these late reprints*. Les amours de Mr. Vieux Bois was first published in Geneva in 1837 and is known in English as The Adventures of Mr. Obadiah Oldbuck . For his graphic literature, Rodolphe Töpffer used a particular lithographic process known as autography, which consisted of transferring drawings made on special paper to lithographic stone. This method was cheaper and quicker than wood engraving while achieving equally good results, and it allowed for the lettering to retain the spontaneous appearance of handwriting. *Many thanks to Töpfferiana for their gracious assistance.